The increased reliance of IT on the cloud has accelerated the adoption of open source operating systems, Linux being the chief among them. Over the past decade, Linux has evolved to be a versatile platform for current- and new-generation applications — a platform that can run in the cloud or on-premises and can include open source tools and frameworks used in modern application development. 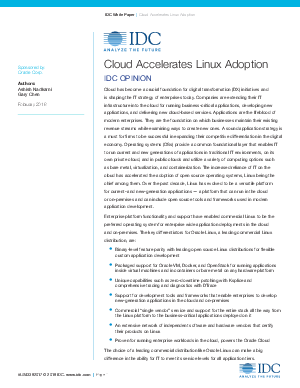 This whitepaper looks at why Linux is the preferred operating system for enterprise wide application deployments in the cloud and on-premises, and discusses key differentiators for Oracle Linux.